Want to plunge into Lovecraftian mystery, without the need for a gaming group? Want to introduce a friend or loved one to the roleplaying hobby? 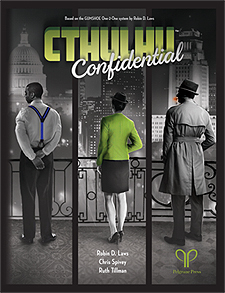 Cthulhu Confidential has come to your rescue! Cthulhu Confidentialre-imagines GUMSHOE, the classic rules of investigative adventure, for the excitement and intensity of head-to-head play. Combine the darkness of 30s hardboiled detective fiction with the cosmic horror of Lovecraft's Cthulhu Mythos. 1937 Los Angeles, its streets dark with something more than night! 1935 New York City, that roaring town, an Egypt inside out! Wartime Washington DC, a sleeping Goliath soon to awake! The Fathomless Sleep, a spiral into memory unspeakable! Fatal Frequencies, illumined by a light that cannot be seen! Capitol Colour, a mystery of meteoric impact! We'll give you the tools you need to face the malign indifference of the Mythos, alone. But will it be enough? Find out, with Cthulhu Confidential.